Aerodynamics in racing multirotors! Part 2. 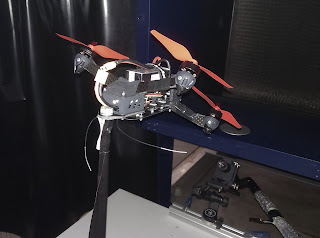 Introduction In part 1 of this article on multirotor aerodynamics, some ideas on how to reduce the aerodynamic drag of racing multirotors was presented. I was also designing a tilted-body racing quadrotor called "Shrediquette DERBE". There were not yet any flow measurements of multirotors flying at high speeds. Therefore, I had to make quite a number of assumptions on the aerodynamics of a racing copter. This time, I am presenting some flow measurements, along with some potential optimizations for the next version of the "Shrediquette DERBE"
Methods Recently, I had the opportunity to do some flow visualizations in a large wind tunnel at the Bremen university of Applied Sciences / Dept. of biomimetics (which is the place where I worked one year ago). I brought the Shrediquette DERBE and mounted it inside the wind tunnel. Prior to the measurements, I did some tests to determine a realistic flight speed and the appropriate pitch angle.